Yesterday I picked up (one of) my copies of Anne of Green Gables and started reading it. 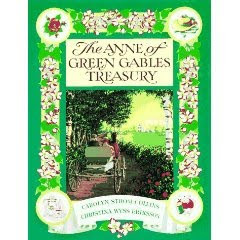 Then, during Bookworm nap time I thought it might be fun to pull out my copy of The Anne of Green Gables Treasury (click on the title to see my review of it from last October) and see if there were any tasty treats I could cook up while reading the story again. Here we believe Mrs. Rachel Lynde used the term "biscuit" to mean "cookie" rather than a scone-type biscuit." All I can tell you is that they have a lot of sugar and butter and despite the fact that I didn't follow the recipe exactly (because, quite frankly, I wasn't paying close enough attention like some other red headed girl I know!) they gave me the appropriate sugar high. And I know I did them wrong! They came out dreadfully flat! But I'm showing a picture anyway in case any of you feel led to tell me what I did wrong! =O! Do! Anyway, I ate my lemon biscuits and went and pulled out my Anne doll that I had tucked away for awhile. Bookworm 1 stumbled upon her and asked what (on earth) this was. Bookworm1: "What is THAT, Mommy?" Bookworm1: Mommy's doll? Who is it? Mommy: "It's Anne of Green Gables." Bookworm1: "Can I play with it?" Mommy: "Never in a million years No. Dolls are for girls. * Mommy's a girl so I have a doll. Mommy needs a girl so she can play with dolls. Do you think we should have a girl so that we can have girl toys and play with dolls?" Well, well. Me and my doll, I guess! For now. 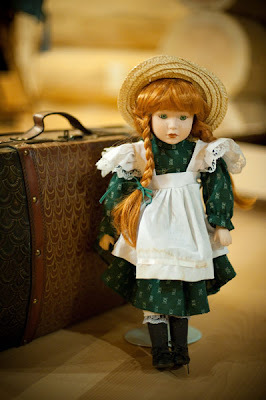 This doll is particularly special to me because my grandmother gifted it to me after she went to Prince Edward Island. See, my grandmother had invited me to go on this trip with her to P.E.I. but at the time I had to choose - I could start my college education or go on this trip. (Finances pressed in on the decision making process.) Maybe to you the choice would have been easy but I admit to agonizing over it. In the end, I did the sensible and responsible thing and started college. I was so disappointed not to go to the Island though and my grandmother knew that. For Christmas that year, I found this doll under my tree. Yes, that would be me. The college student. With the doll. Bliss! Moving on . . . I was poking around online. Want to get your Anne on? Oh yes, that's right! 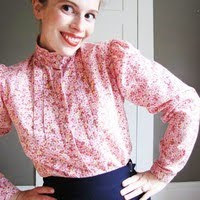 There's a cute little etsy shop that will help you deck out as Anne of Green Gables if you'd care to do so! Literature for the Young Lady is a curriculum that offers a young lady (of approximately 7th grade – 9th grade age) a guide for studying and immersing herself in the virtues of femininity, the domestic skills and arts, literature and history of the Victorian Period, Natural History with a particular emphasis on Botany and Victorian naturalists - all while following along with a most faithful companion well suited to our young ladies as they develop into spirited but gentle young women – Anne of Green Gables. So go forth, have fun, explore and try new things around Anne. Bake cookies (that will hopefully look better than mine)! Wear a hat! Win a locket! Study, think, imagine, dream! Yes! I'm going overboard with the exclamation points! Another great Anne-ish post, Carrie! and scroll down, you'll see her "Autumn in Avonlea" post. Reading your post reminded me of these! I have this book, too, but I've never made anything out of it. Maybe it's time to pull it out! I love it when you blog about Anne. I may have to bake some of those lemon biscuits!! My childhood penpal was from P.E.I. I never had the chance to visit her. Wonder what her life is like now? Maybe I'll try and find her...it would be nice to someday travel there. I just picked up Anne of Green Gables today and started re-reading. I just love how much Anne loves the nature around her--it comes out even in the first few chapters. I read and commented on your FFF post first, and I see now you DID get to go to PEI! I bet that was so fun! I can imagine the struggle between college and going on such a trip. And I totally understand loving the doll! I wish I had a girl to share these things with, too! My DIL loves the films, but I don't think she has read the books, nor is she quite as "into" them as I am. I'm very glad (now) God has gifted me with a girlie to share Anne with. One day we will read all the books together and have a movie marathon (during which NO BOYS will be allowed!). Side note: Dolls ARE for girls. I find it funny that Sam (15 months) NEVER plays with Ellie's dolls even though they are always out in their bedroom. But he's all over Ben's Thomas tracks and Will's books.